Are Plastic Pallets Recyclable and Sustainable? Environmental concern is increasing day by day at every level of society, and the world of business is no exception. This shouldn’t be surprising, as sustainability measures are not only socially responsible, but good business as well. If you’re the decision-maker or owner in a business, you may be concerned about a potential switch to plastic pallets because of the stories of large amounts of plastic garbage forming islands in the Pacific or the news about the presence of microplastics in the environment. These are serious concerns that can have the environmentally conscious wondering: Are plastic pallets recyclable and sustainable? Are iGPS Plastic Pallets Recyclable and Sustainable? The answer is yes, iGPS plastic pallets are 100% percent recyclable and sustainable. iGPS plastic pallets are incredibly durable platforms that can make in excess of 100 trips in their lifetime before they become unfit for the purpose. They will then enter a recycling system to be reground, reformed, and reborn as a new pallet. Recycling iGPS pallets keeps the plastic out of landfills—and out of the ecosystem. Wood pallets, in comparison, can only be recycled into mulch or firewood but are much more likely to end up slowly decomposing in a landfill. Wood pallets have a much higher negative environmental impact than iGPS plastic pallets. The most common wood pallet is a lightweight stringer pallet in which the boards of the top deck are nailed to a two-by-four stringer. Construction techniques for these vary, and stringer pallets can weigh anywhere from 33 to 48 pounds, a low weight if you’re comparing them to typical wood block pallets whose unloaded (tare) weight is generally around 75-80 pounds. If you’re concerned about saving weight on product shipments to reduce fuel costs and the CO2 emissions rate of your business, at first glance, stringer pallets can seem like a low-cost way to make transporting products more sustainable. However, stringer pallets are flimsy and made for single one-way trips. These pallets will most often end up in a landfill, taking up space until they slowly rot away. Building and shipping a single use pallet is a terrible waste of the wood used to make the pallet and is environmentally irresponsible. Block pallets improve on stringer pallets slightly because they are at least made for multiple trips. However, they are also much heavier than both stringer pallets and reusable iGPS plastic pallets, with a higher cost in fuel and CO2 emissions than either alternative. Heavy platforms like wood block pallets raise your Total Cost of Business (TCOB) and your company’s carbon footprint. While block pallets are reusable, eventually, just like stringer pallets, block pallets will still end up clogging a landfill. Both types of pallets are also sometimes made from hardwoods like oak, slow-growing trees which aren’t easily replaced, magnifying the environmental impact of expendable and limited-use wood pallets. In comparison, lightweight, long-lived, and recyclable iGPS plastic pallets are better for the environment in every way. Lower carbon emissions: The iGPS plastic pallet is lightweight at at less than 50 pounds, a weight comparable to expendable stringer pallets. This saves on fuel consumption and reduces greenhouse gas emissions with every load of product your business ships. Longer lifespan: The iGPS plastic pallet can expect to make between 80 and 120 trips in its service life. In comparison, a stringer pallet is able to make about two trips and a wood block pallet about 20. The result is less energy spent harvesting materials, manufacturing materials into pallets, and repairing damaged pallets, with savings on fuel and emissions for every movement and material process. Reduced deforestation: Wood pallets are a constant sink of valuable timber made from the trees we count on to sequester carbon and provide the very air we breathe. Around 5 billion board feet of wood was used to make pallets in 2016 alone, which represents millions of trees logged. Invasive pest prevention: The Asian Longhorned Beetle and Emerald Ash Borer are tree-killing invasive insects that came to the U.S. on wooden packing material from overseas. The Goldspotted Oak Borer is a species native to Arizona that began killing trees when introduced to California. The iGPS plastic pallet provides no meal or incentive for wood devouring insects to hitch a ride on, an important feature for preventing outbreaks of invasive species and helping limit the spread of current outbreaks. Eliminate chemical treatments: Since the iGPS pallet is plastic instead of wood, it doesn’t require toxic chemical treatments to keep insects, fungi, and mold from degrading the wood or being accidentally transported along with the pallet. This keeps goods transported on iGPS pallets free from contamination due to both chemicals and vermin. 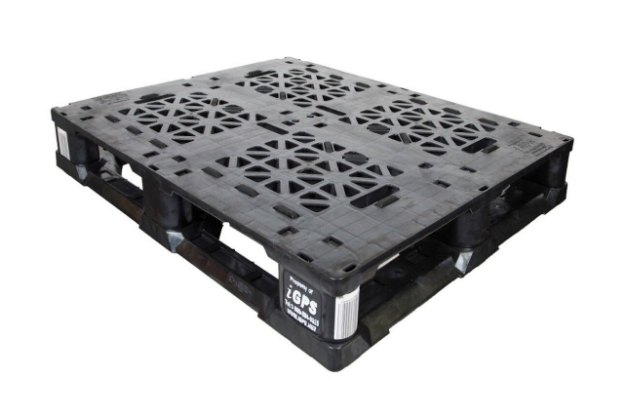 The iGPS plastic pallet combines the light weight of a stringer pallet with the multi-use durability of block pallets. In addition, iGPS platforms have a much lighter weight at less than 50 pounds compared to 75-80 pounds for a wood block pallet. When those weight savings are applied to every load in a shipment, and to every shipment your company makes in a year, the result is significant and positive savings on fuel costs and on the emission of greenhouse gases. You can calculate the emissions you’ll save by using the iGPS plastic pallet pooling system with our greenhouse gas calculator. Sustainability isn’t just good for the environment, it’s good for business as well. Reduced fuel costs are savings that can be reinvested in your company’s future, as well as a way to ensure a healthy planet for your employees and customers. Efficient and reusable iGPS plastic pallets are a win-win way to achieve your company’s goal of being environmentally responsible while simultaneously reducing your TCOB. Only the iGPS pallet pooling system offers a durable plastic pallet that holds up to repeated use and can be recycled at the end of its lifecycle to keep it out of landfills. iGPS pallets ensure your company’s products reach your customers safely, without placing undue pressure on the environment. To lower your Total Cost of Business and your environmental impact with the iGPS pallet, while keeping your products safe and hygienic for your customers, give our team a call at 1-800-884-0225, email a specialist at switch@igps.net, or visit our contact page.